Mitochondria produce energy through a process called oxidative phosphorylation. This process uses oxygen and simple sugars to create adenosine triphosphate (ATP), the cell’s main energy source. A set of enzyme complexes, designated as complexes I-V, carry out oxidative phosphorylation within mitochondria. 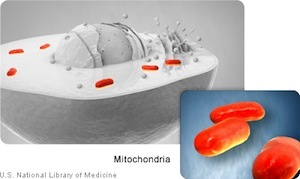 In addition to energy production, mitochondria play a role in several other cellular activities. For example, mitochondria help regulate the self-destruction of cells (apoptosis). They are also necessary for the production of substances such as cholesterol and heme (a component of hemoglobin, the molecule that carries oxygen in the blood). Mitochondrial DNA contains 37 genes, all of which are essential for normal mitochondrial function. Thirteen of these genes provide instructions for making enzymes involved in oxidative phosphorylation. The remaining genes provide instructions for making molecules called transfer RNAs (tRNAs) and ribosomal RNAs (rRNAs), which are chemical cousins of DNA. These types of RNA help assemble protein building blocks (amino acids) into functioning proteins.